An Android Wear podcast player. Recently I was trying to make some adjustments to a screen size for Android Wear so the watch would match the screen size. Most of the ways to do this always seem roundabout to me. I wanted a way to call a simple function like isRound()and get the information I need. I found a custom view someone made on the forms and modified it to return whether the screen is round or square as well. It can then be implemented in the layout just like a LinearLayout. Here’s a method I got from Sterling Udell on the Android Wear Developers Community. What do you think? Does this seem like an acceptable method, or is there an easier way to do this? 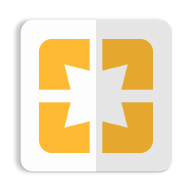 I have a wearable drawer layout in my Android app. The behavior was that the peek view would display the peek fragment and when the user swiped up, the peek fragment would fade to the content fragment. I recently attempted to update my android wear project from wearable 2.0.3 to wearable 2.0.5. A lot of components need to be changed from wearable.view to wear.widget. After the update, both fragments display weather the drawer is open or closed. I tried fading these in and out manually, but there didn’t seem a way to do this smoothly or easily. Is the previous behavior possible anymore? A side note: Using a view within the activity instead of a fragment for the peek view will work as before, but remove the chevron symbol. Another workaround is to add the symbol yourself, but the animation doesn’t work as before. // If the drawer is settling into position and it was opened all the way. In my example, the fadeToPeek and fadeToOpen animate the opacity of the two views to create the desired effect. Hopefully there will be a better solution in the future, but I am satisfied with this one. 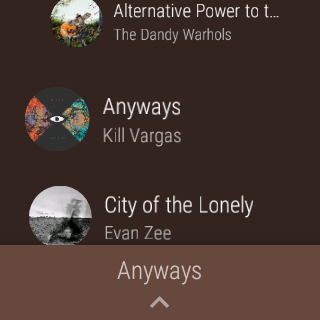 An Android Wear music player with built in FTP for easy music transfer.